Thanks to Sony Computer Entertainment, now you can interact with some games using your body motions via the recent launched digital camera device, PlayStation Eye. 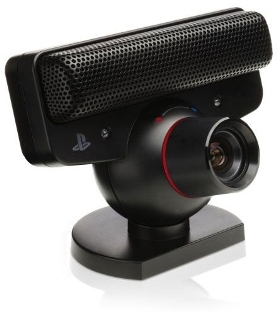 The PlayStation Eye for the PlayStation3 video game console is the successor to the EyeToy for the PlayStation 2. This motion-sensitive camera is priced at US$39.99 in US. The PlayStation Eye has four times the resolution and twice times the frame-rate compare to EyeToy. It is able to capture standard video with high frame rates of 60 hertz at a 640×480 pixel resolution and 120 hertz at 320×240 pixels. Besides, the Eye also features a noise cancelling microphone which allows you to pick up spoken words even in a noisy environment. The interesting device also comes with a software package for use, namely EyeCreate. The EyeCreate allows you to create your very own entertainment. You can save and edit photos, video and audio clips direct to your PS3 and indulge your creative spirit by applying eye-catching visual effects or using one of the special capturing modes, including slow motion and time-lapse. Furthermore, you can also use EyeCreate’s editing suite to turn your media into professional looking movies.